Alwaght- Saudi Foreign Minister Adel al-Jubeir [pictured left] accompanied by the Saudi intelligence chief Khaled al-Hamidan made a secret visit to Israel during the past few days. Elsewhere other reports indicate that the visit was meant to discuss joint Israeli-Saudi military operations against Syria and Lebanon. 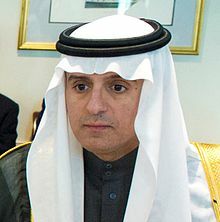 During the clandestine visit, Adel al-Jubeir met with officials of the Israeli regime’s spy agency Mossad. He also met with the regime’s Prime Minister Benjamin Netanhayu and urged Tel Avivi regime to intensify military operations against Syria with the aim of overthrowing President Bashar al-Assad. Elsewhere, high-ranking Israeli regime officials visited the Saudi capital, Riyadh, in the last few weeks to plot against Iran. In a report, Israeli regime’s channel 10 added that said that the delegation was headed by a prominent Israeli official. The visit was not the first one to the Kingdom, but the Israeli regime’s Military Censor prohibits the reports talking about such visits, according to Channel 10. King Salman Bin Abdulaziz and the Saudi princes are not embarrassed by having ties with the Israeli regime. However, they prefer they remain confidential, the report added. Meanwhile, the Israeli channel 10 quoted Saudi officials as saying during the meetings that they are not interested in solving the Palestinian cause. However they want the Israeli regime to stand by Saudi Arabia against Iran. Mid-February Netanyahu said it was time for Tel Aviv make public its close ties with some Arab countries. Speaking during the Conference of Presidents of Major American Jewish Organizations, Netanyahu said that the so-called moderate Arab countries see Israel as their ally, not their enemy, as they share a common struggle against Iran among others. Netanyahu’s remarks came the same day as the regime’s War Minister Moshe Ya’alon said there were open channels between Israel and other Arab states, but the “sensitive” situation prevents him from shaking hands with Arab officials in public. He later publicly shook the hand of Saudi Prince Turki bin Faisal al-Saud. Representatives from the Israel regime and Saudi Arabia secretly met several times in 2014-15 to discuss their positions against Iran. According to a Bloomberg report early June last year, five bilateral meetings were held over the a 17 month period in India, Italy, and the Czech Republic. Reactionary Arab states have established close ties with the Israeli regime unmindful of its unprecedented war crimes, genocide, atrocities against Palestinians and occupation of Palestinian territories especially the third holiest Islamic site, the Al Aqsa Mosque.